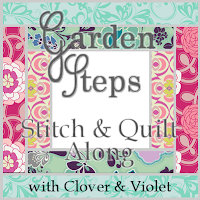 I have finished my fisrt block for my clover and violet garden steps quilt a long. I should have pressed it before I took the photo. I really like it. It's got my own shakey twist to it. Tomorrow the handstitched class starts at stitched in color. I am super excited! Oh I love the look of combining embroidery into a quilt block, I haven't seen much of that. That's just adorable! Thankyou. If you want to see more head over to clover and violets blog. It's one of my favorites. It looks great! So glad you're joining us! Thankyou. I am really enjoying this. Your quilt block looks so pretty, we are using the same fabric, I need to get busy on my embroidery, way behind! When I saw your fabric choice I knew I had to make this quilt. I love them.